After a cuppa break just out of Pietersburg at around 3:00 am, we arrived at the border for a pretty uneventful crossing, just lots of the usual forms and queues (and R270 for my visa)... A few kilometres up the road we arrived at the first crossing on the new BBR line. 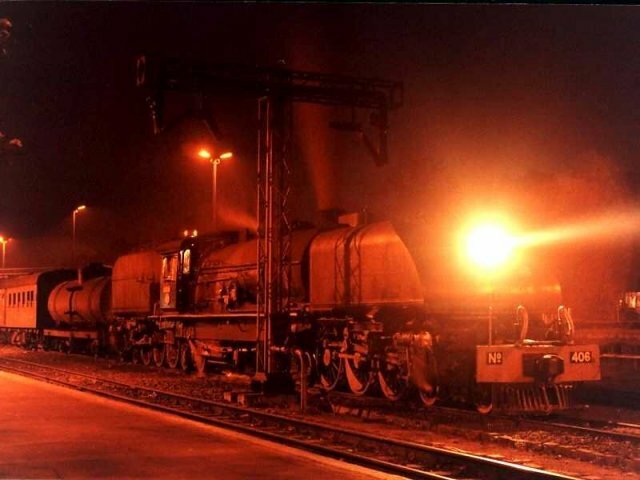 The lights were flashing so we stopped for the train, reaching for cameras in readiness. Alas, no train, the lights weren't working properly yet... There is a crossing guard at each crossing, who sits under an umbrella beside the crossing fence, ready to leap out with his red flag should a train happen along the line. Well, actually they were mostly asleep. 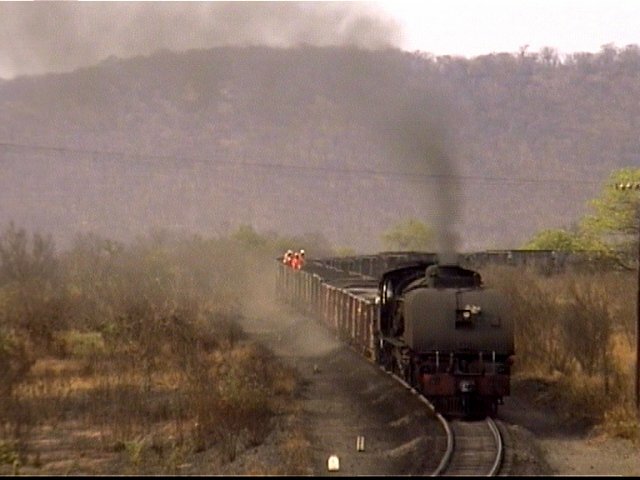 We asked one of them when the next train would be arriving from Beitbridge - "Hmmm, mostly around about 10 o'clock". 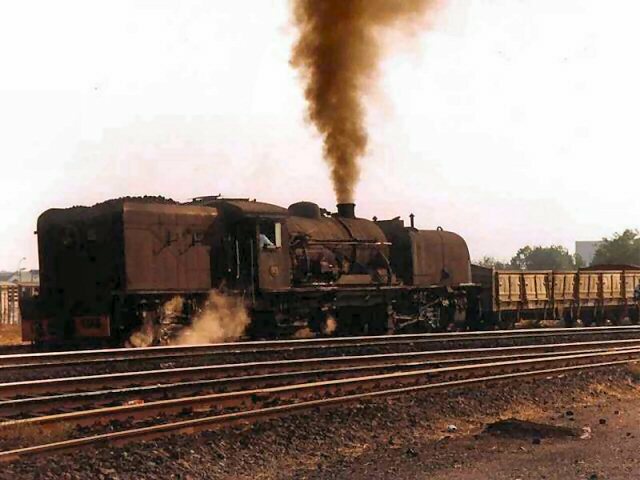 The reply was the same when asked about the train arriving from Bulawayo! We didn't see a single train along the whole section, only a work crew near West Nicholson replacing sleepers that were broken in a recent derailment. We were told later that a car hit a train on the crossing south of West Nicholson, derailing a wagon. 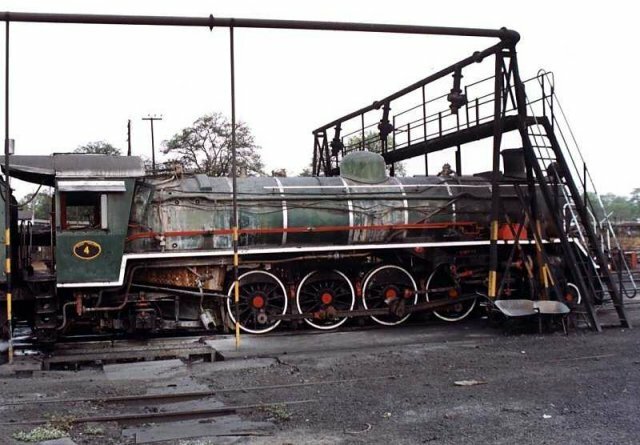 The car occupants died, and the wagon, being quite far back in the load, rolled onwards breaking the sleepers until the air hose finally parted. To break the monotony of the long drive, we started practicing the pronunciation of "Bulawayo" with a single burp. Sounds terrible, I know, but the more you practice the more convinced you become that the name was made to be burped. Apart from that, some of our colleagues in Bulawayo are quite adept at this skill, so we had to at least make the effort. Somewhere near Mbalabala we were stopped by the police, Mike was driving at this point, and the police decided to search the car. They looked in the boot, under the seats, under the bonnet, we have no idea what they might have been looking for... Arrival at Bulawayo was just before 10:00am, where we stopped to visit some friends and to pick up Dave Putnam from the Museum. 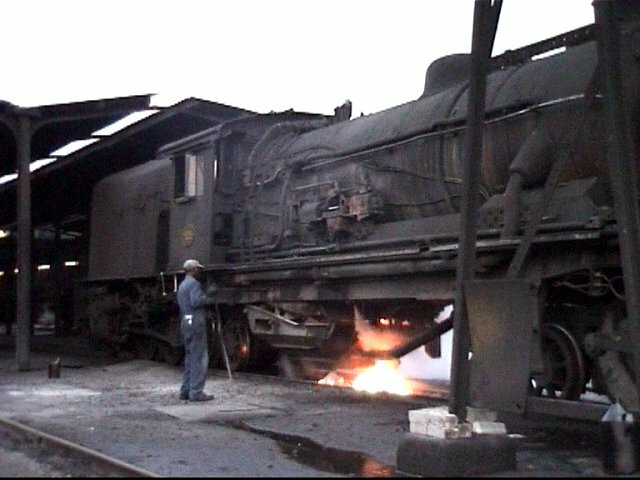 The NRZ Museum at Bulawayo is still progressing well. 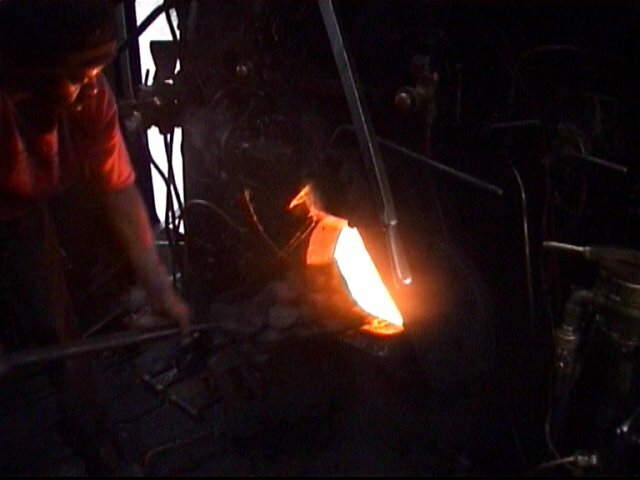 Unfortunately we were a week early, because the Museum are holding an open day on the 30/31st October weekend, where their 7th class will be in steam. This will be the last run of this loco before it is withdrawn due to boiler condition, and it will probably not run again for some time. 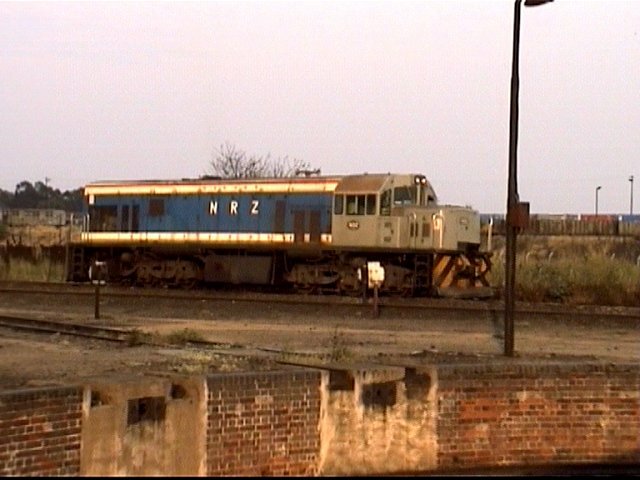 We saw 20th class #736 parked in the corner, this loco was owned by the late Dusty Durrant. 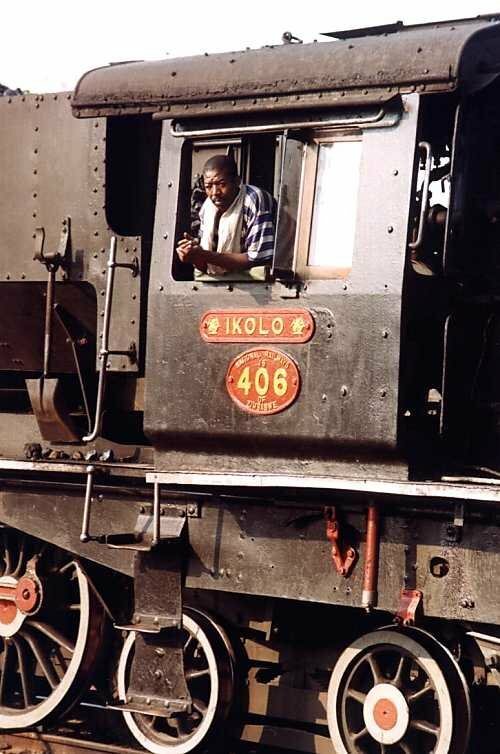 It seems now that the Museum will take ownership of the loco, and it is possible that this massive engine will be restored to service in the near future to run in the Victoria Falls area by the Steam Africa Express company. As it turned out, Mr. Putnam was unable to join us on account of a big party booking at the Museum which he was organising, so we pointed the car's nose North once more and headed into the stifling heat. Soon the conversation turned to the cold draught beer that we knew was awaiting us at Victoria Falls. We soon found that there was a problem in the timing of this. Should we get a draught before the meal, another with, and a final one after the meal? Or perhaps one while waiting for the drinks menu, or another while waiting for the first one to arrive? Or should we forget the meal part and just have cold beers? Lunatic ravings? Perhaps, or maybe the hot sun and monotonous drive had affected us. In any case we had a lively debate on the subject, a conclusion being reached just before we reached Hwange at around 3:30pm. We headed up to Wankie Colliery and made our presence known the the shed foreman, who was more than happy to let us wander around and photograph the trains. 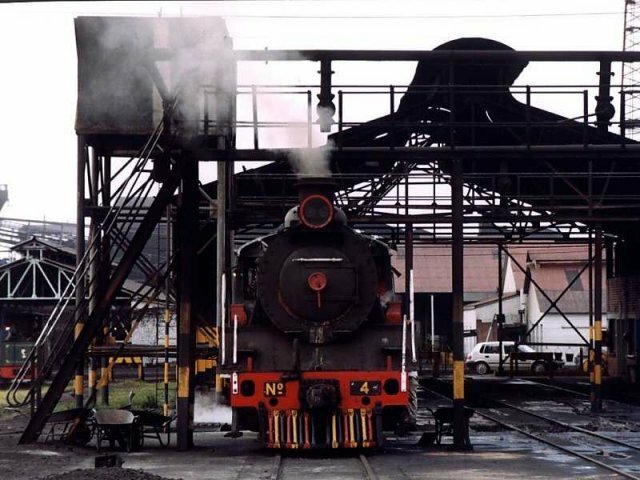 19th Class #4 was on shed and in steam, whilst 15A #10 was in the shed cold and awaiting repairs. 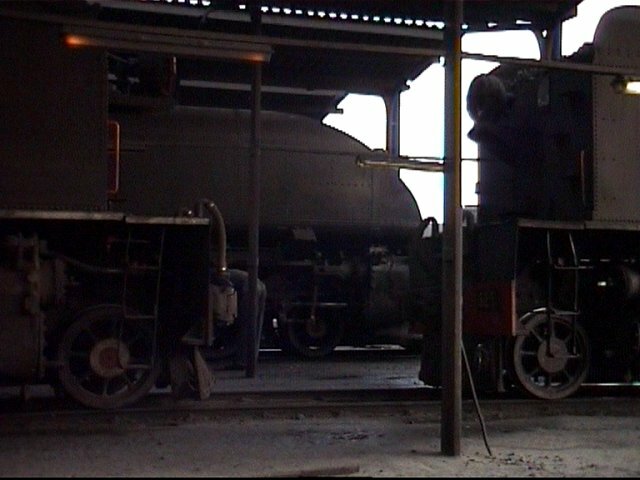 15A #11 was in the workshop receiving some attention, and partially stripped 19 #5 was dumped at the front of the shed. 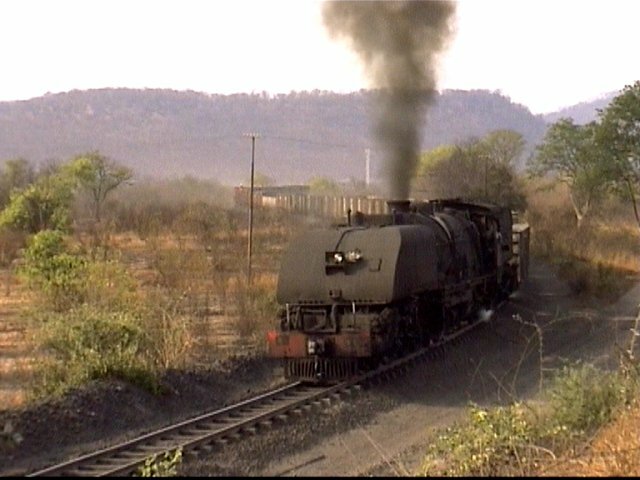 There was a 15A in steam (#395, presumably on hire from NRZ) that we had seen in the plant area, so we set off to find it. 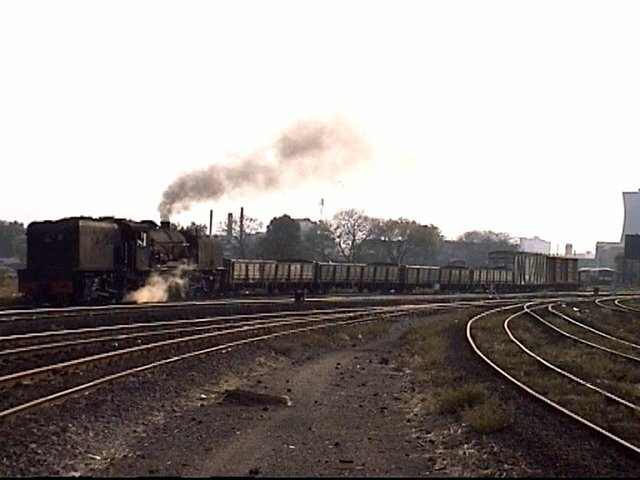 It was nowhere to be seen, so we made our way down to the Thomson Junction transfer yard where the Garratt had just arrived, creeping into the yard with a long string of loaded wagons. 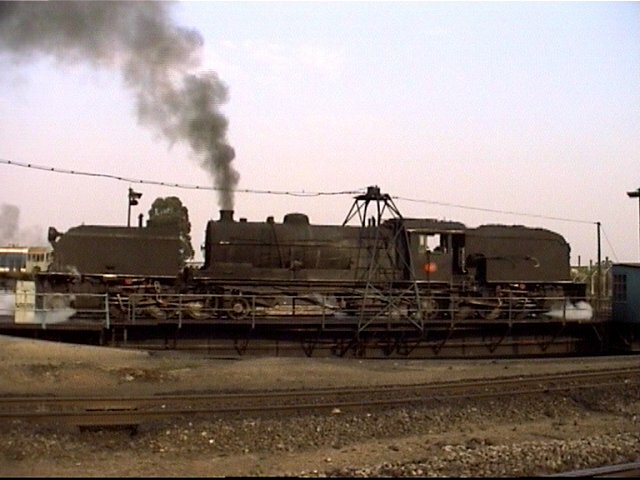 NRZ DE9A #1950 and another unidentified DE9 were on shunt duties in the yard. 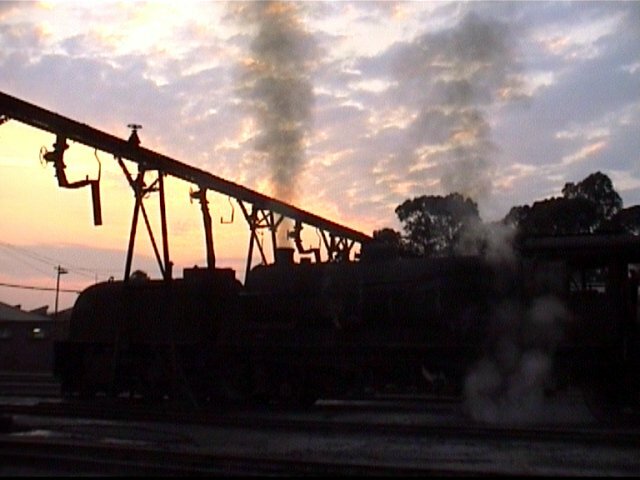 Within minutes, the big 15 had detached, run up the yard and coupled onto a load of empties for the return run. 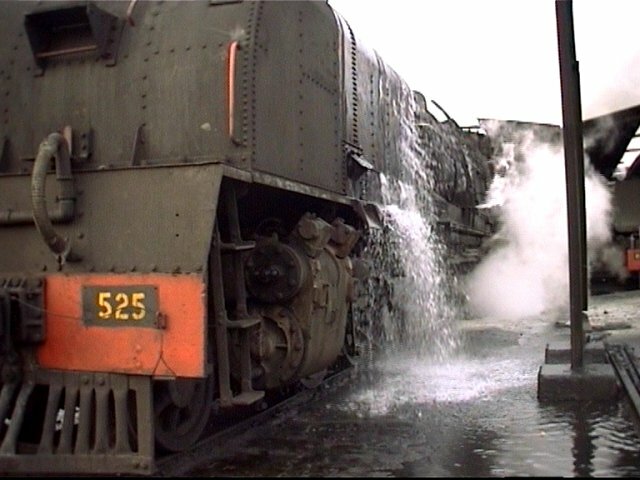 We had a quick look around the station, 15A #406 was in #2 road, simmering away under the water column. 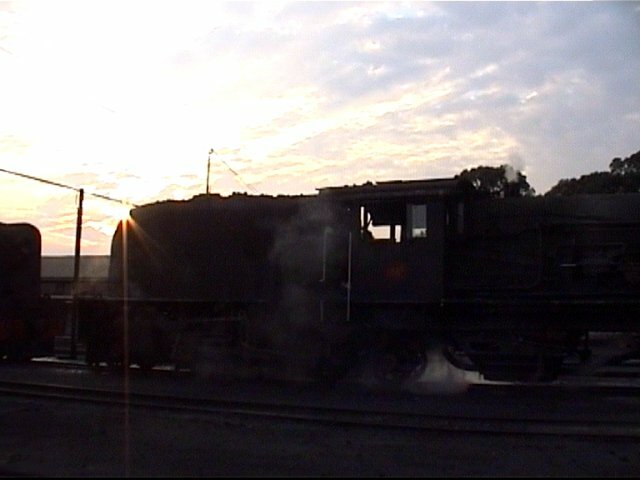 Near the goods shed, ZR 12th Class #204 was also in steam. Green 14A #512 was also there, but not in steam. Dinner was at the new Kingdom entertainment complex near the Victoria Falls Hotel, and the draughts were everything we'd dreamed of and more. Afterwards we tried our luck at the slot machines, but luck was not on our side. In spite of the 21-hour day and the long drive, getting to sleep was not so easy what with the sauna temperatures inside the chalet and the many mosquitos that swarmed through the open windows. After finally falling asleep, we were rudely awoken by Nathan at around 4:00am, who had turned on the light and was leaping around the room in his underpants, chasing the mice that were trying to get into his clothing bag. As we were preparing to depart, we noticed that the stove was on and the kettle was a bit melted. We had put the kettle on before we went to bed, but I had turned off the wrong switch. Perhaps this accounted for some of the heat in the chalet?! Still, we were feeling most refreshed early the next morning as we set off for that station. 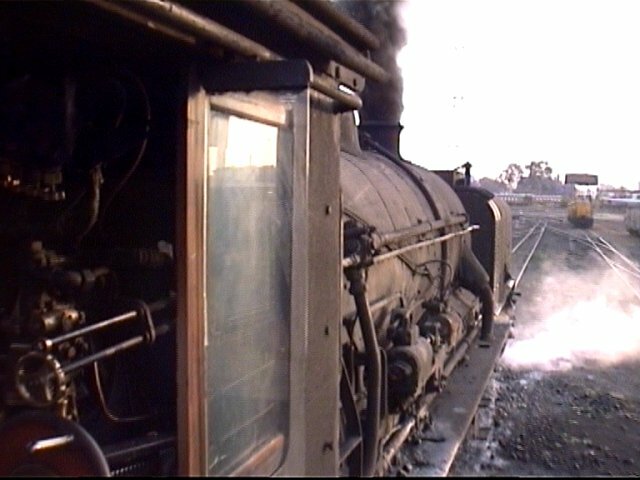 We took a few shots of the 15A at the station, and saw the 12 shunting its coaches around the yard. 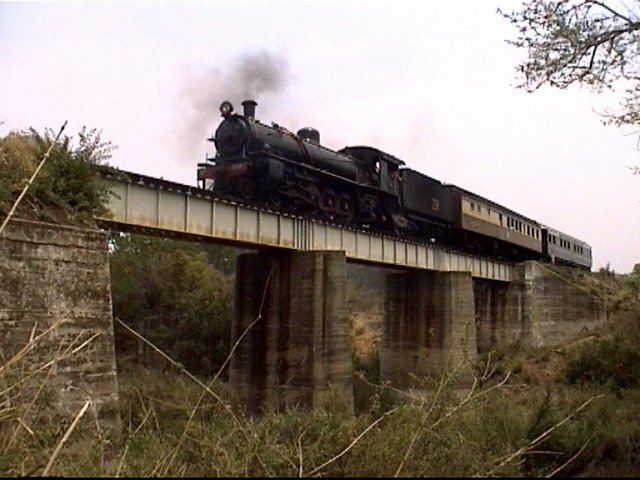 The Bulawayo passenger was running an hour or so late, so we missed its arrival. We had decided to head into Zambia to get some shots of the 12 at work, so after a quick breakfast at Wimpy (and Nathan dashing around trying to buy a new video tape) so we drove down to the border and cleared customs on the Zimbabwe side. After some negotiations, we struck a deal with a taxi driver to take us across to Zambia and into Livingstone. 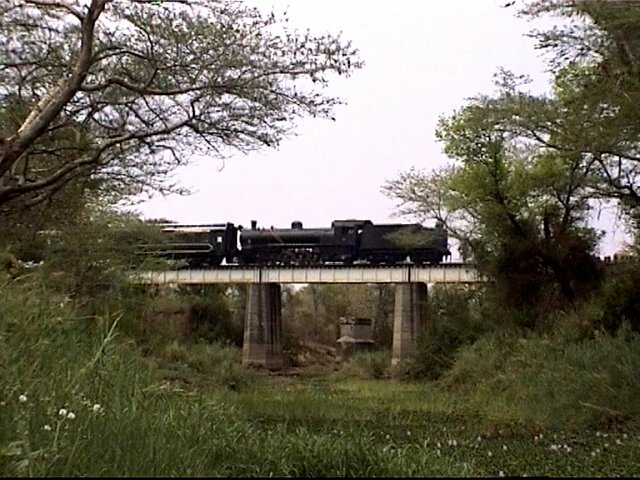 As we were doing the customs thing on the Zambian side, the 12 crossed the bridge with her train, so we sped off towards Livingstone to find a decent place for a shot. 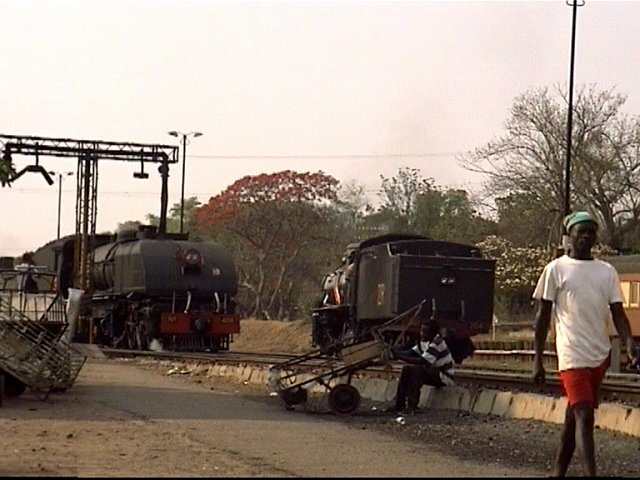 Next stop was Livingstone Railway Museum. The entrance fee of 10 Pounds Sterling for the three of us must make it one of the more expensive Museums I've been to! 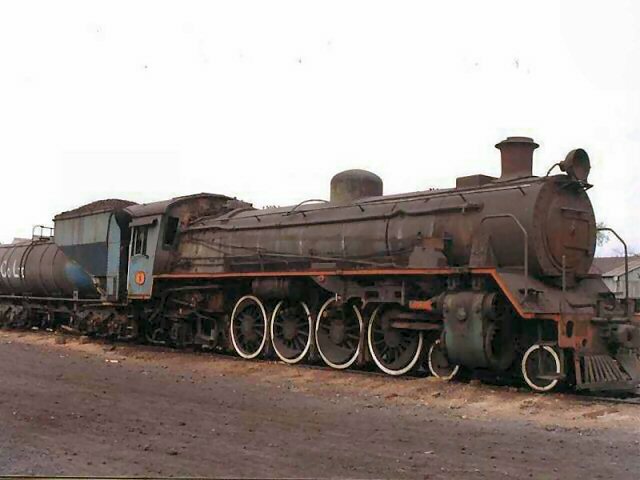 The place had quite a run-down air about it, some of the locos were in good condition, others terrible. 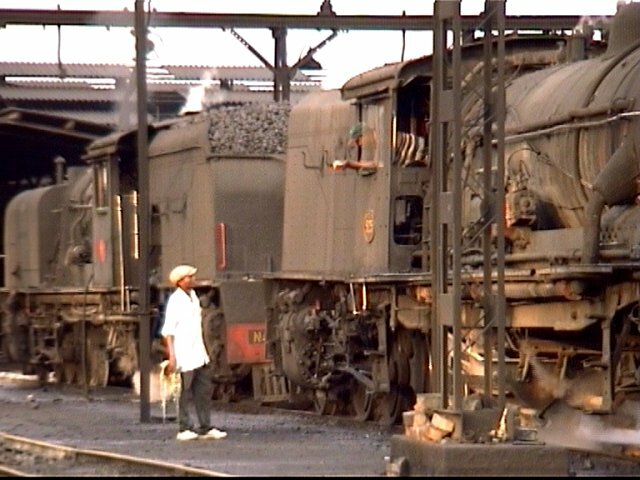 Some of the locos there were: 7 955, 8 1126, 16A 623, #96, 12 181, 15A 401, 10 156, 20 708, #91, #57. 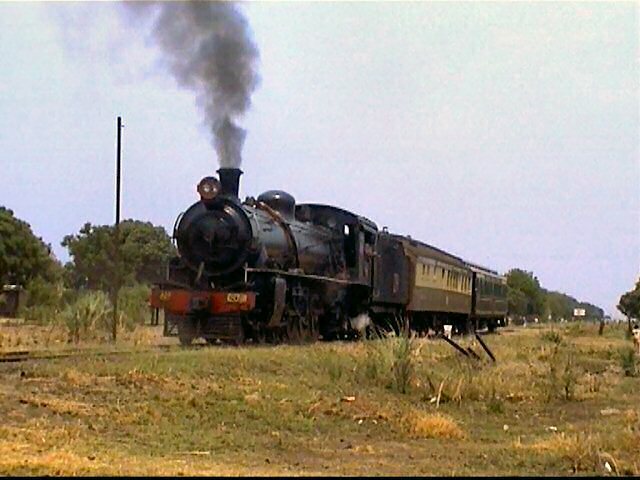 The 12th class stopped out the front to let some of the passengers visit the Museum, after which it continued another 6km or so down the Mulobezi line, propelling the coaches. 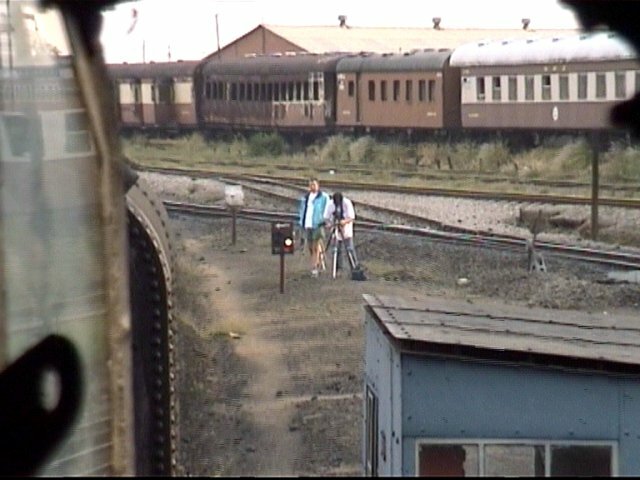 When the train returned, we set up for a shot but the heat was too much for my tripod, as the tilt handle splintered and came off... Had a quick look at Livingstone station, where we saw ZR diesel 02-307 departing with the Mulobezi mixed at 11:15. 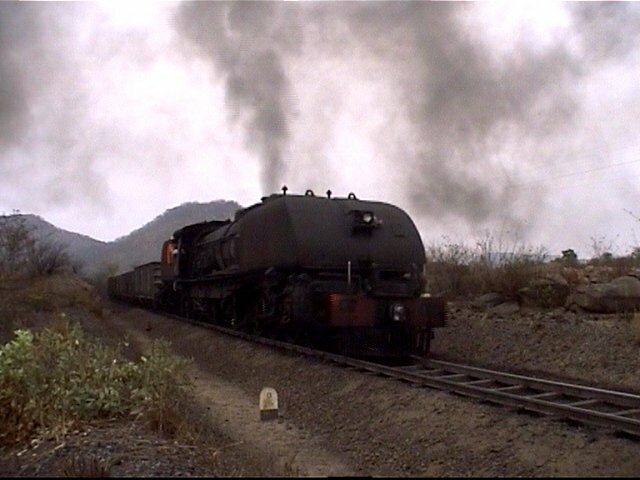 The consist was a combination of ex-SAR compartment coaches and ZR stock. The 12th class was on its way, so we stopped again at the Nansazo bridge for a nice 3/4 shot of the train crossing. The light was a bit flat but still okay. Nathan left his video camera in the car on account of having no tape, but then I found the tape on the embankment where it had fallen out on our earlier visit, so this time the situation was reversed but no less frustrating! We had reached the northern-most point on our trek, which we celebrated with a well-deserved Mosi (Zambian beer) under the shade of a tree at a local hotel. We were two countries away, but it could have been a whole world, yet we were not even as far from Pretoria as Cape Town. 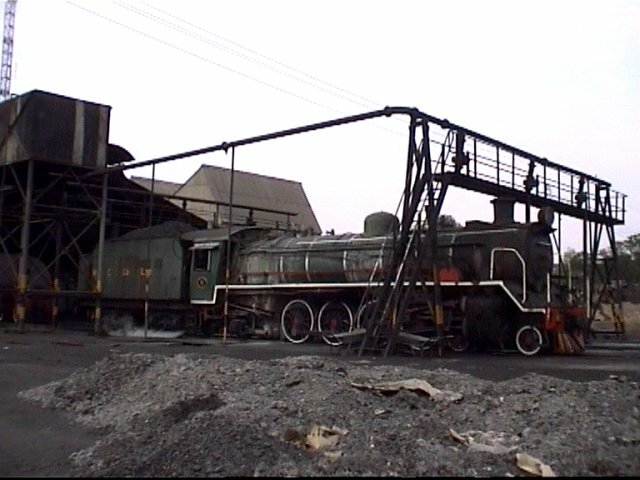 After lunch at Victoria Falls, we proceeded back to Wankie Colliery once more. 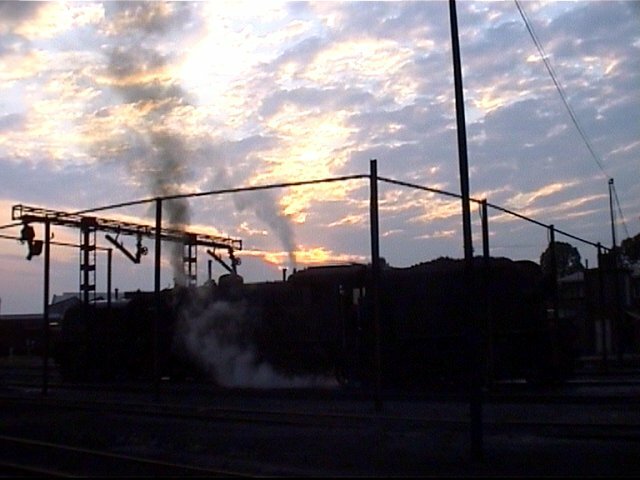 Our timing was good, from the road we could see the 15 entering the transfer yard. We took a couple of shots around TJ, then set up for the return run at a different place to the previous day. The 15 again made an impressive sight straining up the grade, although the didn't have any sun, making conditions a bit dim. 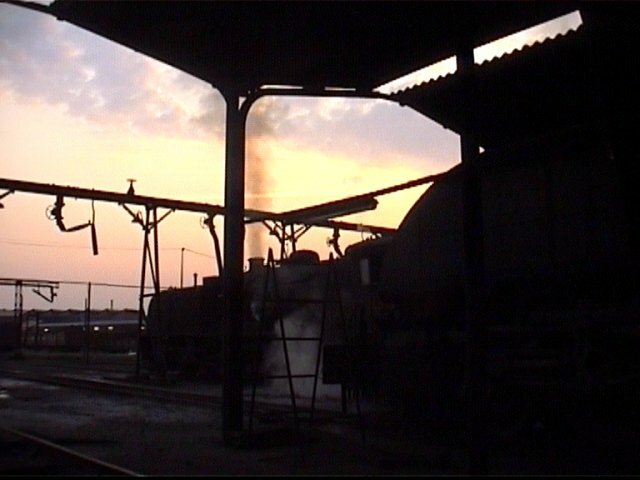 After a bit of shunting at the plant, the Garratt coupled onto a loaded train, so we set up to shoot it leaving the yard. 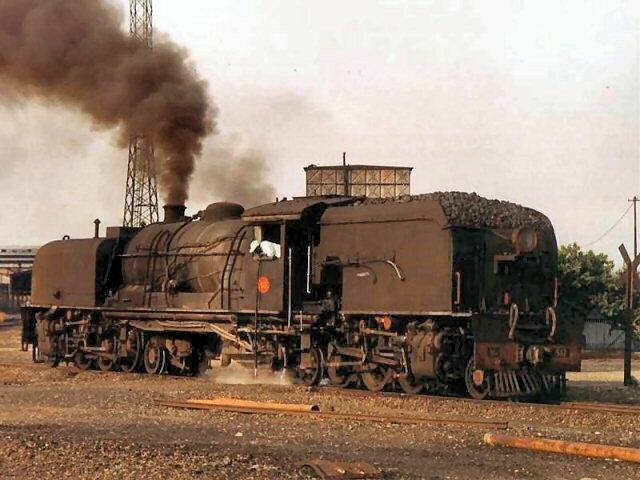 The loco sat there, made lots of smoke, whistled, made more smoke, popped its safeties, waited some more, then uncoupled and sped of to TJ light engine! Again we got some good shots of the train thrashing up through the S-curves, but the lighting did just not give the same atmosphere as the previous day. Mike took over the wheel for the long haul back to Bulawayo, and not 5km from Wankie we were pulled over by the local constabulary for speeding. The story from the police was that we were traveling at such a great speed (which I don't really think we were...), they couldn't possibly impose a fine, the matter had to go to court on Monday, two days hence. We explained that this was quite difficult as we had to be back in SA by Sunday evening. They replied that it would be wrong to allow us to continue on our journey considering that we were lawbreakers. Long negotiations followed, and we ended up paying - how should I say - an undocumented traffic infringement penalty? The maximum fine they could impose was Z$1600, but this would cause problems for them because they would be questioned as to why the matter was not escalated to court, given the terrible crime that had been committed. Therefore the only way to settle the matter was to pay the maximum fine, but for no documentation to be issued. Makes a lot of sense... I think... In any case it lightened Mike's wallet by 30 Pounds Sterling, with Mike vowing not to drive until we reached South Africa again, having had enough of the local police by now! I had heard that Zimbabwe have the best police force money can buy, and this certainly supports that rumour! 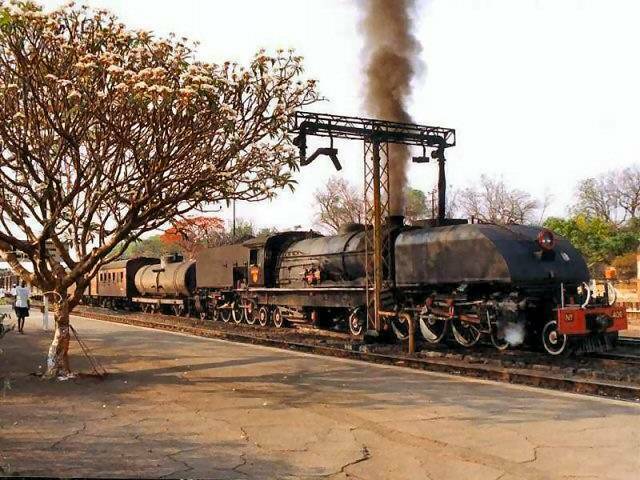 The 20th class Garratt should have been at Victoria Falls in service. It was recertified recently and ran a 1000 ton freight to Plumtree and another back again. 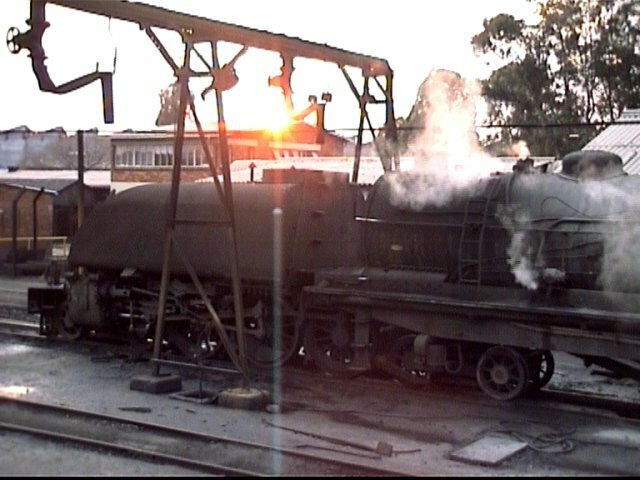 The loco was being towed up to Vic Falls in steam and in a load, and somehow the crew managed to blow a cylinder cover off, so it's back for repair once more. 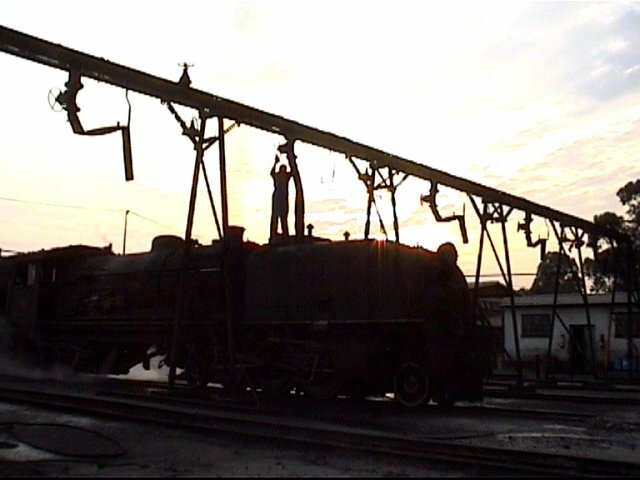 Took a few shots in and around the shed of locos being prepared and leaving. The crew of 525 gave me a ride up to the turntable, and we got the loco turned just for variety! We then walked down to the station area. 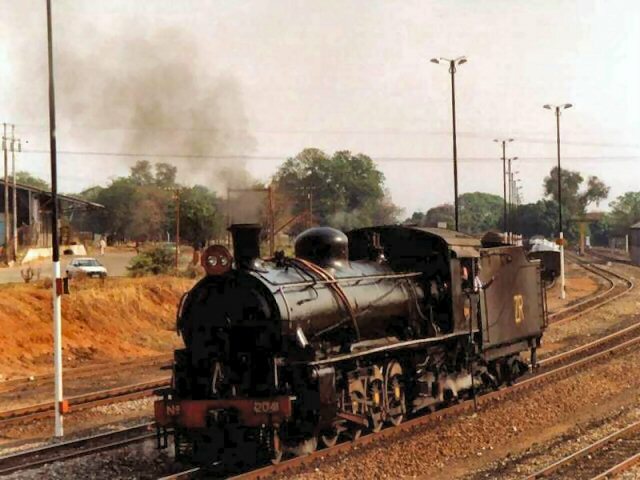 This was quite busy, with the Chiredzi mixed pulling in, two 14's working the station shunt, the Harare passenger train arriving (DE10 1059), followed by the Rovos Rail train. Quite a mixture of steam, diesel, old and new liveries. There were a couple of DE9A's (1963 & 1915) at the shed as well, these had been refurbished recently with caterpillar engines. There were a few DE6's (1602, 1607) moving about the place too. 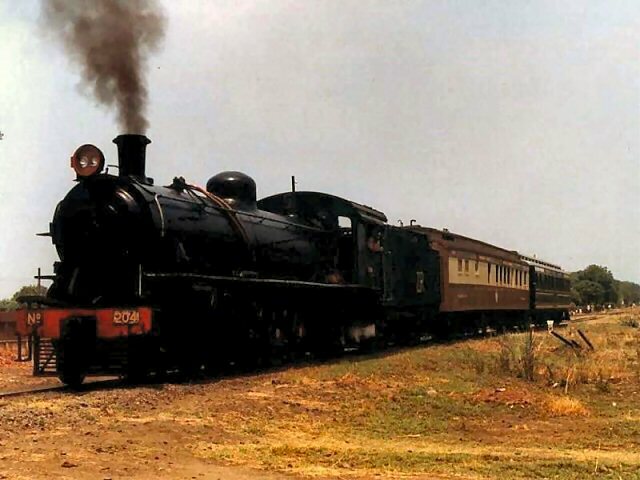 I was told that 6 DE10's, along with 18 passenger coaches and some goods wagons have been sent to the Congo as part of Mr. Mugabe's efforts up there. This seems to have caused a bit of trouble in Zimbabwe, as reliable DE10's are in short supply. Some trains have apparently had to be cancelled due to lack of motive power, and DE9's have been put back onto the main line in some cases. 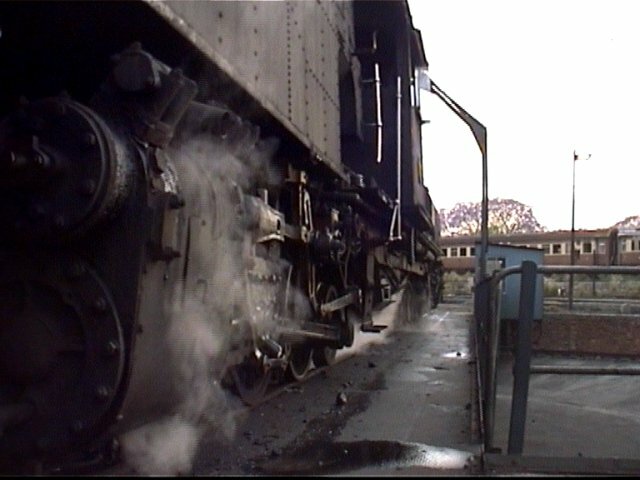 Perhaps this is the reason for more Garratts being in steam, as some of the DE9 shunts have to be done with steam again. On the long drive back, we again saw no action on the BBR line, perhaps Sunday is the quiet day? Arrival back in Pretoria at 7:30 pm. Mike even had a drive on the way back, with no police hassles this time, just a massive thunder storm! 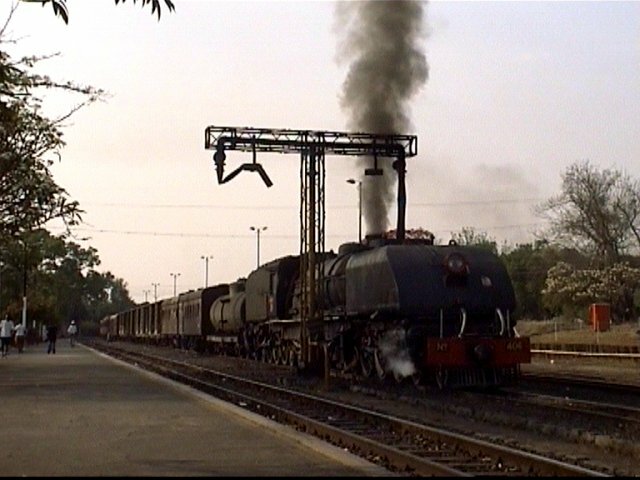 We had covered 2600km to see 12 locos in steam, that's an average of 1 every 217km, quite a trip but well worth it.